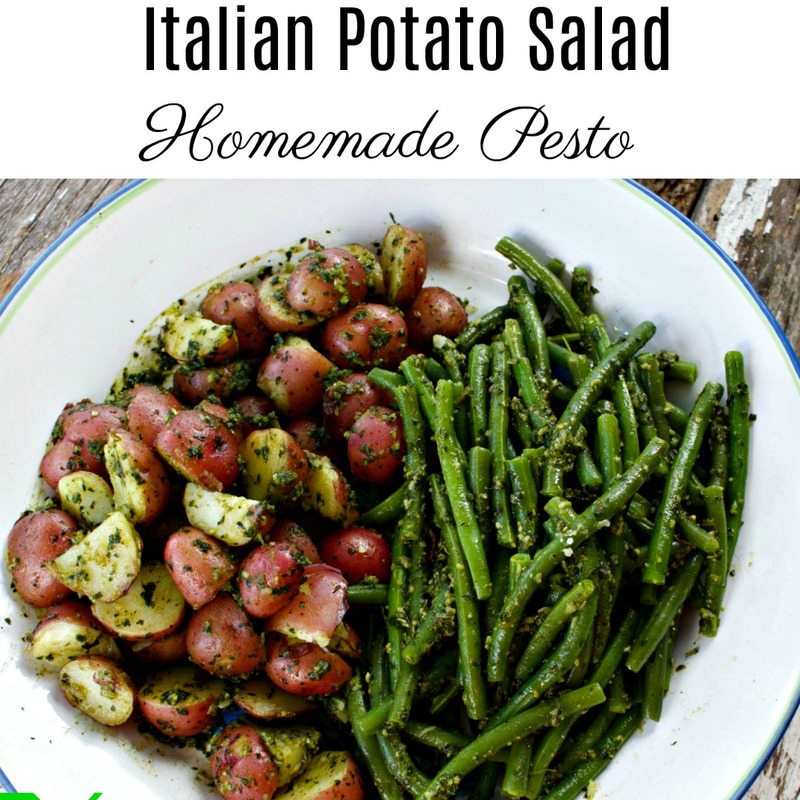 Italian Potato Salad is a dish that showed up at every picnic and summer holiday when I was growing up. It’s not complicated. It’s not dangerous in the heat. It’s tasty and almost everyone loves it. Back then, my family didn’t make pesto. They simply used olive oil, oregano, vinegar, salt and pepper. That’s not a bad dish, but this is just a little more special. This will take the place of that mushy potato salad that curdles and worries us at outdoor gatherings. I made Italian Potato Salad with Pesto for our Easter picnic at the farm, with no worries about spoiling or mayonnaise. We took the leftovers home and we ate on those potatoes for the next few days. They can be fried for omelettes, frittatas etc. They can be heated and served warm. This is the dish that is okay to sit out for a long time. It’s served at room temperature, and I guarantee will go fast! The beauty of this dish is that you do not need to peel the potatoes. It’s a simple dish that adds a lot of bulk, color, texture to a table with very little effort. Pesto is so easy to make. The store bought pestos don’t have the same fresh taste and are too often too garlicky and not in a good way. Pine nuts are expensive, so I don’t use them as much, but I do miss them. Walnuts are a great substitute, and you don’t need too many of them. Truthfully, in this recipe, you can skip the nuts if you want. Flavor is what you’re looking for and the Pecorino Romano will do its job. I go back and forth about what cheese to use for pesto. Pecorino Romano or Parmigiana Reggiano? As long as you have an authentic cheese from Italy, use either or a combination. We prefer to use both, but lean towards the pecorino if just using one. It’s the saltiness we love so much. (Costco sells both Pecorino and Parmigiano Romano in nice big pieces at a reasonable price. Never buy pre-grated cheese. There are too many reasons to go into, but the flavor, quality and quantity will be diminished. She adds butter at the end, which makes the pesto creamy, and she mixes the cheese in by hand, even if using a food processor. Those two rules for an authentic pesto have stayed with me for years. Also, it’s important to reserve some starchy water (it can be pasta water or potato water) to add into the pesto, so its not so oil heavy. This is a room temperature Italian potato salad. The biggest mistake you could make would be to refrigerate the potatoes, because that will change their texture and pesto is not good cold. Make these the day of your event and leave them out. Once the day is over and you must refrigerate, then I recommend eating them heated. You can even heat and cool off a little. I like to serve this with a side of green beans made the same way, as they just go together so well. If it’s tomato season, add some fresh tomatoes for an Italian trio. 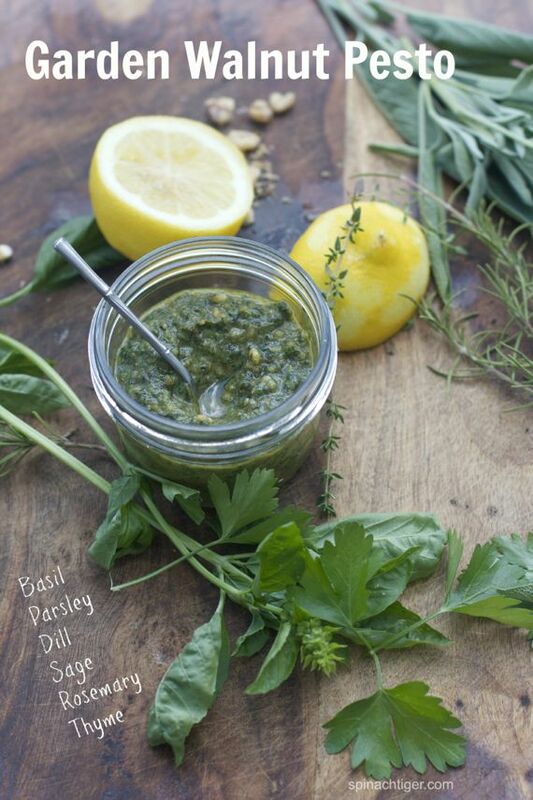 You might also like this pesto recipe made with all the herbs from my garden. 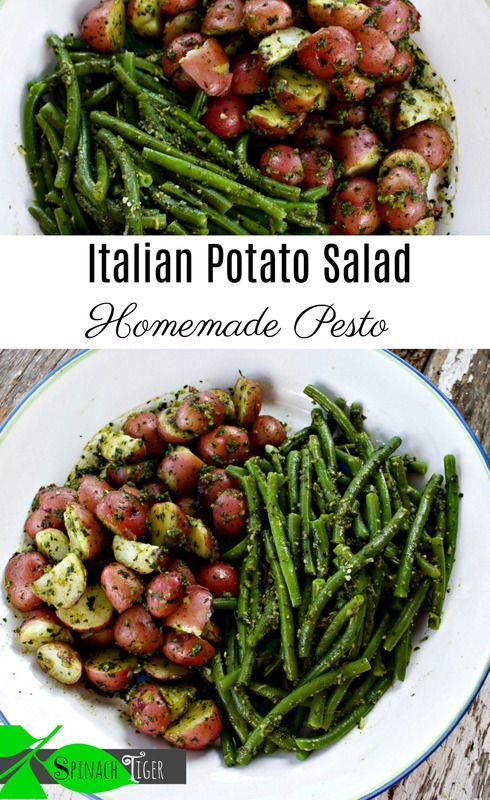 Boiled Potatoes with a Pesto, served at room temperature makes the most delicious Italian Potato Salad. Scrub the potatoes clean. Remove any parts of skin that you would not want to eat. Cut in large bite sized pieces. If small, cut in half only. Put in large pot with cold water 2 inches above potatoes. Bring to boil. Turn down to a simmer, until the potatoes are fork tender. Wash basil and pat with paper towels. Process garlic, pine nuts (or walnuts), basil, olive oil for processor until you have a creamy consistency. At this point add in some hot starchy water, a tablespoon at a time to thin down just a bit. Add in the rest of the ingredients by hand, first adding in all cheese until it is really smooth. Then add butter in at the end. You can choose to skip the butter if you want to. 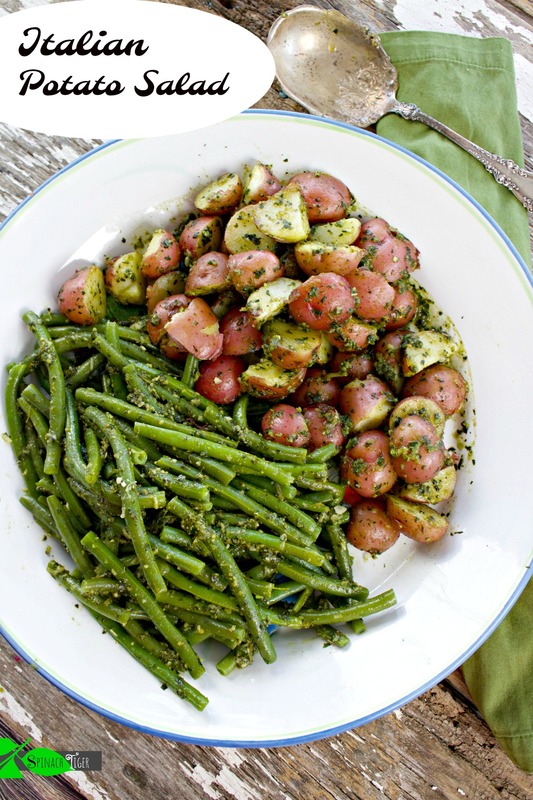 Toss potatoes with pesto while they are still warm.